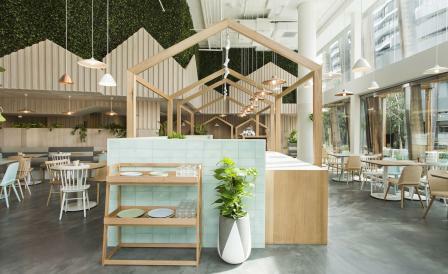 Tucked away on the quiet banks of the Yarra River in Abottsford, the latest addition to Melbourne’s daytime dining landscape is the curiously titled Kitty Burns. All blonde wood, daylight, foliage and the right amount of pastel, local practice Biasol Design Studio has created a space that capitalises on the abundance of natural light and impressive sense of scale – that comes with a 360 sq m space with 6m high ceilings – while configuring the venue in a way that averts a cavernous feel. Banquettes, booths and table settings line perimeter walls, creating a focal point out of the central bar and coffee service area. Tasmanian Oak wall paneling, pastel turquoise tiles, a generous helping of plant life and Biasol’s custom designed copper and white pendant lights complement each other to form a warm, bright and likeable space that you’d be happy to spend a morning in. In the kitchen, Scottish-born, classically trained chef Aaron Duffy has devised a menu of not-so classic takes on café and breakfast fare, such as Togarshi spiced avocado on toast, an omelette served with slow poached smoked rockling and a breakfast Eton Mess, with coconut yoghurt, meringue, buckwheat cluster and strawberry.